Let’s start by looking at the pattern preparation. 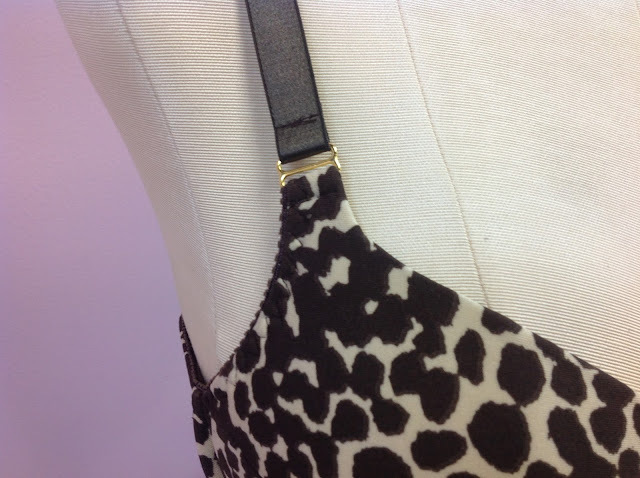 How about that curvy strap tab and demi-style neckline edge? 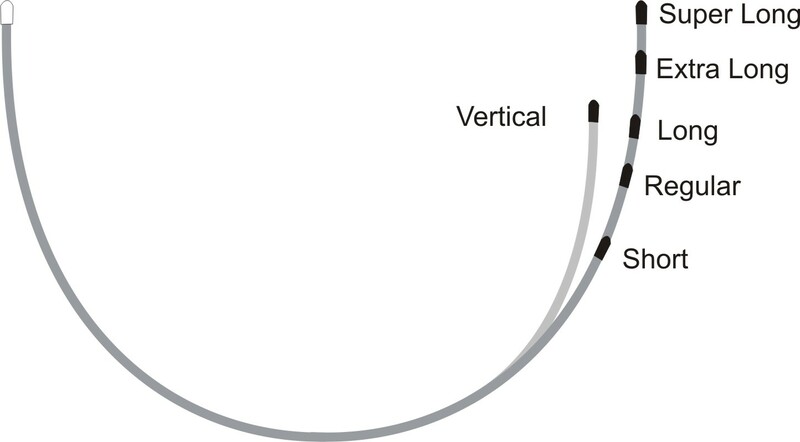 In order to prepare the strap tab area for the slider connector, we need to change up the strap tab area of the pattern. 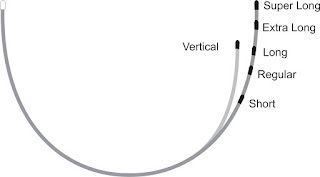 Your pattern for the upper cup may look like this – the strap tab is clearly too short and too wide to accept a slider or other connector. We need to add some height to the tab but also narrow its width so it can fit into the slider. I need to lower the front edge of the upper cup as well. Notice that I used a gentle curve to keep the amount of coverage over the breast mound. I love the look of a lowered front, but…I don’t want to girls to hop out! Keeping some of the breast mound curve will prevent that from happening. The front will be lowered but I still maintain a full coverage cup – the best of both worlds, in my opinion! Now let’s look at the actual construction. The cut & sew foam is our FF-30 pre-finished foam padding also called poly-laminate foam, foam sheeting, or foam by the yard – and it’s in the ivory colour. We sewed it together at the cross cup with a regular zig-zag (usually the width is about 3 mm and the length about 1-5-2 mm) This is where testing the stitch on a scrap pays off – you don’t want the stitches to stretch the foam, but you don’t want to see daylight through the seam either! You can clearly see the roll-over finish on the top (neckline) edge. We allowed 1/2″ (12 mm) for the turn-over allowance so we would end up with a 6 mm showing of fabric. This is cut & sew foam so I tend to use a wider roll-over on the edge. If this were a pre-formed foam cup, I would use a smaller seam allowance and thus a smaller roll-over edge, but for cut & sew, the 1/4″ ( 6 mm) edge rolls over well and lays nicely without waving or cupping, on this fabric and foam combination. In the above photo, you can also see the seam across the cup of the cover. I didn’t topstitch this seam – I liked the look of it without any stitching, and the fabric laid flat without it. Hey – stranger things have happened in the world of sewing! 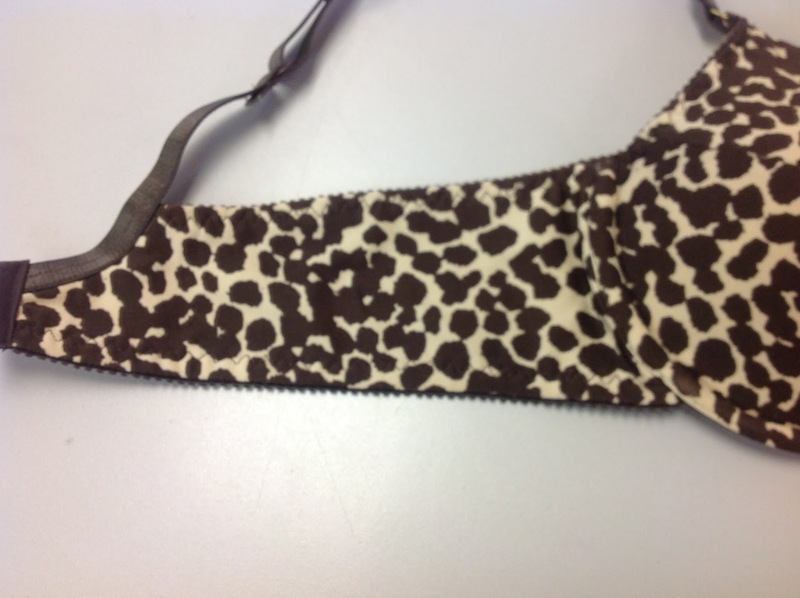 This giraffe print was very stretchy (some would call it flimsy!) so it wasn’t strong enough to use for the back band all alone. No problem. We lined the back band with power net and used the flimsy fabric over top. I spray basted the 2 layers together, treating them as one layer during the rest of the construction. 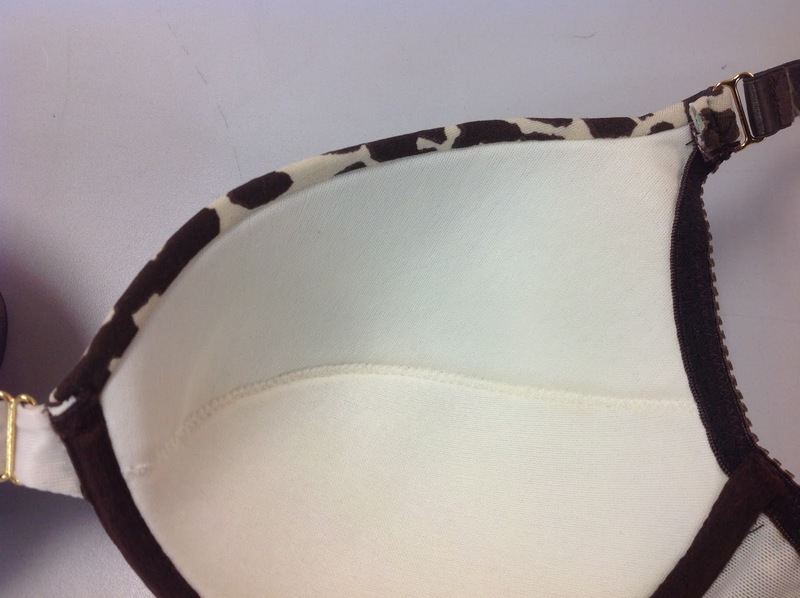 I hope you have enjoyed this peek behind the seams of the Giraffe Print Bra – there are lots more to come, I assure you! But before you ask…NO, there isn’t any more of this print available! Sorry about that! But you know, there are LOTS of other suitable stretchy prints just waiting at your local fabric store! Ha! I was just going to ask if you had any of that print left! I like the slider on the bridge – it IS cute.